You love your dog; they’re a member of your family, and you want them to enjoy Lake Tahoe with you, right? Along with several trail options, there is an abundance of Public dog friendly places to let your dog run and play – alone or with others at Lake Tahoe. 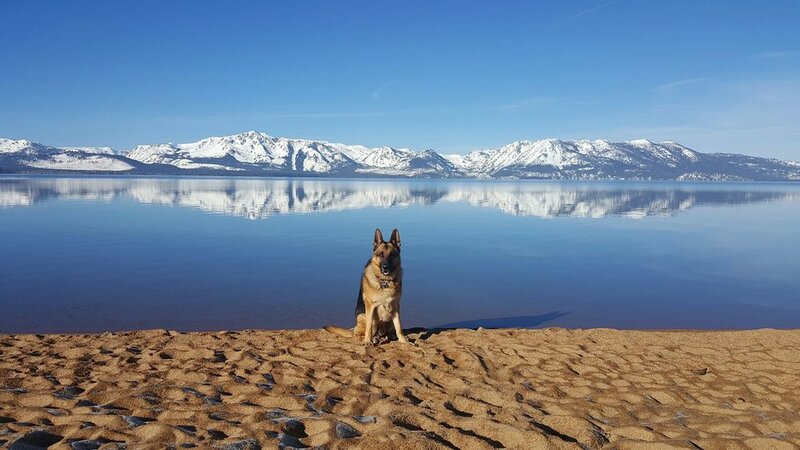 If you want to bring the pooch to Tahoe, check out the dog friendly Kiva Beach near Baldwin Beach. Here dogs can swim off-leash, but they need to be leashed on the beach. Another good thing about Kiva is that the parking is free. There are no bathrooms (only portable potties), but the beach is rarely visited by as many people as other beaches. Hot Tip: The swimming areas at Kiva are some of the best and deepest at the lake. Zephyr Cove is fun for the entire family and this is where you can catch the M.S. Dixie II paddlewheel boat. The North section of the beach area is also a dog-friendly area where well-behaved dogs can play in the water and on the beach. There are picnic tables, BBQs and shade for the family as well. Hot Tip: Zephyr Cove also has some great tent camping spots and dog-friendly cabins. Skylandia Park and Beach is located on the West Shore near Tahoe City. The beach is still fairly unknown in the summer and doesn't get as crowded as other beaches. A great time to come is during the fall and winter months where the dog can run free on the beaches and in the water. Pets are permitted only on dog-friendly beaches at Skylandia and they must be on a leash. There are doggy waste bags available at the park. Hot Tip: The parking lot can fill up quickly in the summer, but wait until the evening for empty beaches and free parking. Echo Lakes near Highway 50 and South Lake Tahoe is a fun place for hikers and for the family dog. These two lakes nestled in a granite basin are just before Desolation Wilderness and have some easy hiking paths around them. The Echo Chalet has parking, a restaurant and a water taxi in the summer that takes people and their pets across Lower Echo Lake. Hot Tip: Get to the parking lot early in the morning to find a good spot, or head up there in the evening for a sunset hike. The Mokelumne Wilderness and the Carson Pass area are a few miles south of South Lake Tahoe and offer many trails, alpine lakes, vistas and fishing holes for families and their dogs. 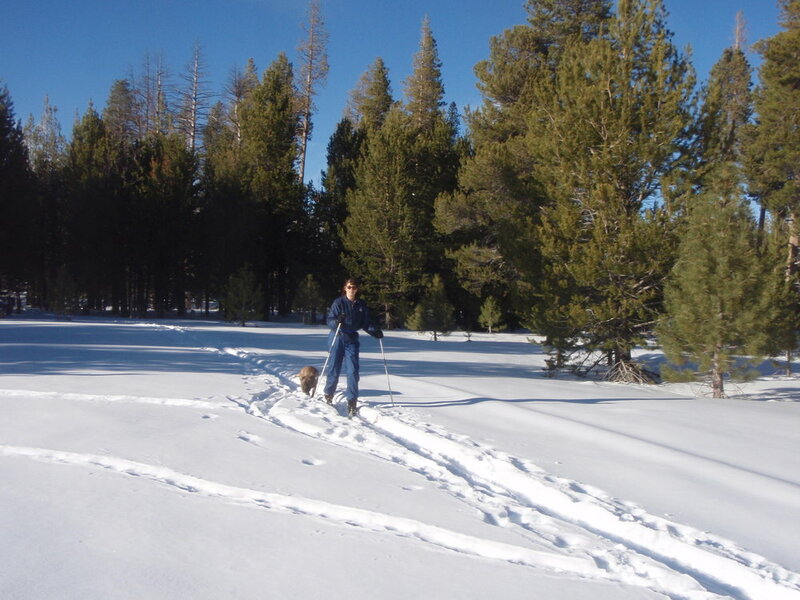 Many of the trails (like the Winnemucca Lake Trail and the Pacific Crest Trail) allows dogs with and without leashes. Hot Tip: Check out the Hope Valley Resort for a dog-friendly place to eat and grab a beer. A beautiful and easy stroll with your dog along Taylor Creek can be a perfect part of the day. The rush of the rapids below adds a air of tranquility, and also provides several convenient watering holes to quench your dog's thirst. Dogs are allowed off leash here as long as you keep them under voice control. This trail will bring you up to Fallen Leaf Lake and continues all the way around it if the mood commands. Hot Tip: This is a lovely place to walk in October when the Kokanee Salmon are running in crimson and green against the backdrop of golden Aspens. Be aware, the bears are attracted to the fish as well. Keep your dog close! Directions: Take Emerald Bay Road (89) about 3.5 miles from the intersection of 89/ Hwy 50. There are usually a fair amount of open parking spots. Patton Beach is located in Carnelian Bay and is a small rocky beach with picnic tables, restrooms and a nature walk. This beach allows dogs and tends to stay fairly uncrowded in the summer. Dogs are allowed off-leash, but you owners must clean up after them and have the under voice command. Hot Tip: There is a mini golf place and several restaurants in the area for the human family members. The Carnelian West beach in Carnelian Bay has a free parking facility and boating buoy area by the Gar Woods restaurant. This wide, flat beach has year-round public restrooms and accepts leashed dogs. Barbecues and picnic tables allow you to picnic at the water's edge. Hot Tip: There are some grassy spots on this beach that can be rented for special events. Dogs are not allowed on these areas. Dogs love the Tahoe snow just as much as you do and they are allowed to ski with you on the cross country trails at Tahoe XC. There area few special green loops where dogs are allowed to "ski" without leashes. The cost is an extra $4 a dog and poop bags are offered free of charge. Hot Tip: Dogs are not allowed in the XC lodge, but afterwards take the down to Scraps Dog Bakery in Tahoe City for a snack.